Night is my morning, why? why? Know is morning, why? why? Although Ben gave absolutely everything he could to others, and had some similarities with the giving tree, he was not altruistic. Being altruistic means to give things to people for no reason without asking for anything in return. The giving tree and Ben give all of things that they can give, but Ben helped people because he was feeling guilty and he wanted to make himself feel better. However, what people gave to Ben was that they could let Ben feel better. Ben wanted to atone his mistake through helping people, and these people gave him a chance to do it. At the end of the movie, the people showed their thankful to Ben and it was just what he wanted. The boy in giving tree story didn’t show his thankful to the tree though he felt thankful, but the tree still happy because it thought that it had tried it best. The last but not the least, Ben suicided at the end of the story. This behavior made his friend, brother, and all the people who love him felt sad. The giving tree didn’t kill itself but it still let the boy felt happy and thankful instead of being sad. Who has received no pay. For what he thinks is right. And who has won his freedom. A tiger came out and teared the young man into pieces, the princess was crying quietly. She thought that the young man would rather die for the her but didn’t want to with another girl, so she thought he would opened the door which was come out with tiger. The princess told him the wrong answer because she wanted the young man to be alive although she couldn’t with him anymore. But the truth is the young man didn’t love the princess that much, he loved another girl more than he love the princess. He was afraid that if he broke up with the princess then the princess would kill him, now it was a chance to get away from the princess. The king knew the young man love another more than his daughter so he wanted to protect his daughter, he didn’t want his daughter with someone who lied to her. No one was the victim or the perpetrator in this event, the young man wanted to survive and with someone he loved, the princess wanted to save someone who “loved” her, and the king just wanted to protect his daughter. The king was the most winner, he protected his daughter successfully though the princess would might be angry and upset to the king. Keesh was a confident, clever, and brave boy. Firstly, he showed his brave character at the beginning of the story when he says, “It is true that my mother and I are given meat to eat. But the meat is always old and tough, filled with bones, and difficult to eat.” This shows that he was very brave because he had courage to speak out. He wasn’t afraid of standing up to and speaking to the hunters who were older than him. Secondly he said, “I shall never speak in this council again-not until you come to me and say ‘Keesh, we want you to speak.’” Although it is very rude when a child talks like that to an adult, it also shows that how confident Keesh was. He had the confidence to go hunting by himself with nobody and bring some meat back to share with everyone. He also wanted to prove himself that he was not just a kid because he was the son of Bok; the best hunter in the village. Lastly, Keesh was also very clever. At the end of the story, he explained why he could kill a big bear, even a bear with cubs. Everyone was surprised and realized that the way to hunt bears was using the brain. This shows that Keesh was very clever because no one thought of it. The hunters only knew how to fight a bear but didn’t know how to hunt a bear. All in all, Keesh was a confident, brave and clever boy. Once upon a time, there was a little girl. She always wears a pink hood so everyone calls her little red ridding hood. One day her mom told her to visit her grandma. The little pink ridding hood promised her mom quickly and told her mom that she won’t talk to the stranger in the forest. The little pink ridding hood went through the forest and told to herself that she couldn’t talk to any stranger. Suddenly, a bear came to her and said “Hey, are you alone?” The little pink ridding hood nodded her head but didn’t say anything. The bear kept talking to her “I am alone, too. Can you play with me? 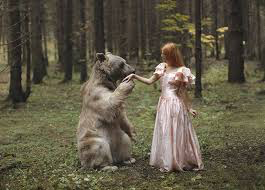 I am not a bad guy such as the wolf, we can be friend.” The little pink ridding hood looked at the bear and she started to think that the bear was not the bad guy. She smiled at the bear and started to play with the bear. “I want to eat this stupid girl when she doesn’t notice!” the bear smiled at the little pink ridding hood at played with her happily. Unfortunately, a wolf went by and saw a little girl was playing with a bear. “Is it the little girl that wore a red hood and killed my brother before?” the wolf thought angrily “I am going to eat you!”. The wolf quickly ran to the little red ridding hood and wanted to eat her. The little started to screaming and the bear growled angrily and started to fight with the wolf; however, the bear didn’t want to share it dinner with a wolf.